Sometimes you want to display XHTML in the browser, but all you see is the XSLT data for the Zen report. This can occur for a number of reasons, including a DEFAULTMODE setting of "xml" in the Zen report class. However, there are situations that causes problems when you have correctly set DEFAULTMODE to "html" or $MODE=html, yet you still cannot see the XHTML output as you expect. This section describes what to do in those cases. 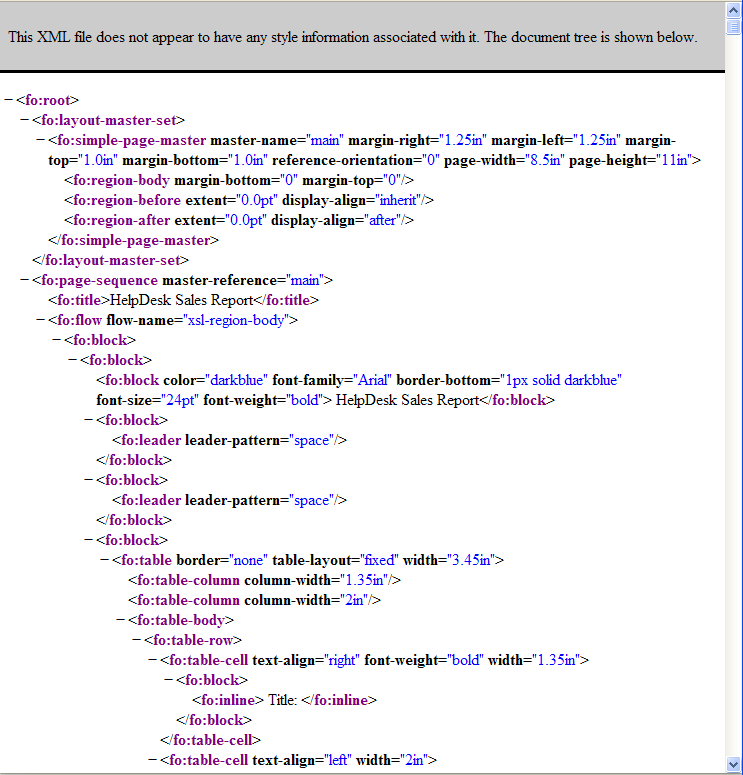 When invoked in the browser, a Zen report generates XML, sends this XML to the client, then transforms this XML to XHTML on the client by following an xml-stylesheet processing instruction. The attributes for this instruction appear as query parameters in a URI string sent to the browser. Internet Explorer only understands URI instructions that have one parameter after the ? question mark. Problems can occur when the generated xml-stylesheet instructions for a Zen report class contains multiple parameters and the browser is Internet Explorer. For this reason, many of the Zen report class parameters provide the information needed in xml-stylesheet processing instructions, so that this information does not need to appear in the URI query string. Once you have correctly configured the class parameters, Zen handles these instructions appropriately, regardless of the browser. The Zen report class has its CSP class parameter PRIVATE set to 1. This makes the page private. A private page can only be navigated to from another page within the same CSP session. In this case Caché automatically adds the CSPToken parameter to the query parameter string in the URI, so on Internet Explorer the string cannot support additional query parameters. The Caché namespace and database associated with your Zen report has been configured with the Allowed Authentication Methods field on the Excel Servers page set to Unauthenticated access. Unauthenticated access causes a problem that Password authentication does not. Password access requires a user to enter a username and password before running a Zen report that is associated with a particular Caché namespace and database. This login transaction gives Zen the opportunity to detect that the browser supports cookies, so that when the user subsequently enters the URI of a Zen report, multiple parameters in the query string work well. Without a login transaction, Zen has no opportunity to detect that the browser supports cookies, so that when the user subsequently enters the URI of a Zen report, additional parameters in this query string do not work on Internet Explorer. Use the Web Applications page (System Administration > Security > Applications > Web Applications) to configure the Caché namespace and database that contains the Zen report class with a Use Cookie for Session value of Always. Use class parameter EMBEDXSL=1 in the Zen report class. Use class parameter STYLESHEETDEFAULTMODE="tohtml" in the Zen report class. Use the Web Applications page (System Administration > Security > Applications > Web Applications) to configure the Caché namespace and database that contains the Zen report class with an Allowed Authentication Methods value of Password, and verify that the class parameter XSLTMODE="server" in the Zen report class. XSLTMODE="server" is the default if the parameter is not set. Install Java if it is not installed. Ensure that the JAVA_HOME environment variable is set. This variable is used by FOP in generating PDFs. Ensure that the Java installation directory is on the path used by Caché Server Pages, or the path the Caché user uses. Changes that you know you have made to the Zen report class do not appear in the PDF output when you view your Zen report. This can happen due to caching of previously displayed pages, especially in Firefox. To overcome this problem you must fully exit Firefox and start a new Firefox session before viewing the revised Zen report. It is not necessary for you to restart Caché. Broken installation of the renderer (FOP or RenderX). An XSL-FO command that the rendering engine does not understand. Zen generates XSL-FO following the XSL-FO standard, but not all rendering engines are complete implementations of the XSL-FO standard. FOP, which is free of charge, is known to be incomplete. Syntax errors in XData ReportDisplay. The rendering engine (FOP or RenderX) can report these as errors when Zen does not catch them on the server side. The PDF report should display. Make sure the /Applications/Cach81/mgr/temp directory on the Caché server is empty. Try to view the output file test.pdf. Several URI query parameters are available to help in troubleshooting Zen reports. These parameters allow you to view and save the intermediate and final files generated by the transformation pipeline. These files might include generated XSLT or XSL-FO files, text files containing error messages from the XML parser, or the final XHTML or PDF files that result from the completed pipeline. For information about how to supply report options as URI query parameters, and how to handle side effects that may occur in some browsers, see the section Invoking Zen Reports from a Web Browser. In that section, the table URI Query Parameters for Zen Reports lists all possible URI query parameters. This section lists only a few of them. $LOG  Use with $MODE=html or $MODE=pdf to view diagnostic messages. $MODE  Choose one of the values listed in Changing Output Mode to View Intermediate Files to view one of the intermediate files. $NODELETE  Save intermediate files to the general Caché temporary directory. $REPORTNAME  Save intermediate files with the name and location of your choice. $USETEMPFILES  Save generated XSLT files in the CSP directory for your application. To enable diagnostic query parameters to produce a text file listing errors detected by the Saxon parser while it generates XHTML output, you must configure Zen reports with the location of the Saxon .jar file. Zen reports can produce useful diagnostic information from the XHTML generation process without this command, but they do not produce the additional messages from the Saxon parser unless you provide one of the commands described here. Where 57772 is the port number assigned to the Caché server. The following figure shows an example where $MODE=pdf&$LOG=1. Here the volume of output from $LOG=1 is significant because the document contains many pages and the rendering engine is RenderX. Sometimes there is little or no output from $LOG=1. The number of messages depends on the parser in use (FOP or RenderX) and how that parse is configured for logging (quiet or verbose). Where 57772 is the port number assigned to the Caché server. The following figure shows an example where $MODE=xslfo. The message This XML file does not appear to have any style information associated with it displays at the top of the page because the output is neither XHTML nor PDF. $LOG and $MODE each display only one form of output at a time, and do not save the files for later viewing. When your processing pipeline for report output has multiple intermediate files of various types, you can add the query parameter called $NODELETE to save all intermediate and final output files for later viewing. Zen assigns these output files arbitrarily generated names such as 2037q4XM9.xsl. You can identify the specific file you need by its time stamp and filename extension. You can reset this location using the Startup page (System Administration > Configuration > Additional Settings > Startup). In the TempDirectory row, click Edit. Enter a subdirectory name other than Temp. Caché creates a subdirectory of this name under the Mgr subdirectory in the Caché installation directory, as shown for Temp in the previous example. When you change the Caché temporary directory, it changes for all Caché applications, not just for applications that use Zen reports. You can use $NODELETE during regular processing, when $MODE=html or $MODE=pdf, or you can combine it with special values of $LOG or $MODE to save the output for further study. The $REPORTNAME query parameter allows you to save all files generated by the transformation pipeline with the name and location of your choice. This default may be changed, as explained in the section Preserving Intermediate Files for Later Viewing. To ensure that output files are well organized, InterSystems recommends that you set a value for REPORTDIR if you plan to use $REPORTNAME. Unlike most parameters that share a name except for the $ (dollar sign), there is no relationship between the REPORTNAME class parameter and the $REPORTNAME query parameter. 06/19/2008 02:55 PM  <DIR>  . 06/19/2008 02:55 PM  <DIR>  ..
You can run a session like this without setting the Saxon .jar location as described at the beginning of this section. You still see the intermediate files, but you see no error messages in the browser and no .txt file is generated, so you have no information about syntax errors from the parser. This sample session also works with $MODE=pdf. Because the FOP and RenderX rendering engines always produce a syntax analysis, in the PDF case the browser always reports on error messages, and you always see a .txt file that contains a syntax report. As a commercial product, RenderX has better syntax analysis than FOP, so it is useful to be able to run RenderX to analyze PDF generation errors. If you are generating XML, for instance by setting $MODE=xml, you save only the .xml file. The purpose of the $USETEMPFILES and USETEMPFILES options discussed in this section is to work around a limitation in the xml-stylesheet processing instruction on Internet Explorer. This limitation causes display problems, particularly when the Zen report class has its CSP class parameter PRIVATE set to 1 (True) or session cookies are turned off. The problems arise only when report processing is done in the browser. For this reason, $USETEMPFILES is only valid when XSLTMODE="browser" or $XSLT=browser. $USETEMPFILES does not work when XLSTMODE="server" or $XSLT=server. A Zen report class generates an XSLT stylesheet. It subsequently uses the generated XSLT stylesheet to generate the output XHTML. There is a URI parameter called $USETEMPFILES that you can use to save this interim XSLT stylesheet as a file. The default for $USETEMPFILES is 0 (false). In this case Zen generates and uses XSLT but does not save it to a file. When the $USETEMPFILES query parameter is set to 1 (true) Zen saves the intermediate XSLT stylesheet to a file so that you can view it for diagnostic purposes. $USETEMPFILES addresses display problems that occur when the browser is Internet Explorer, report processing is occurring in the browser (it happens on the server by default), and the Zen report class has its CSP class parameter PRIVATE set to 1 (True) or session cookies are turned off. Zen saves the .xsl files for $USETEMPFILES in a different location for each Caché namespace. $NODELETE saves all intermediate files in the same Caché temporary directory. Internet Explorer users are limited in the number of URI query parameters they can use when invoking a Zen report from the browser. These users might not be able to supply $NODELETE or $REPORTNAME as a URI query parameter in the browser address field. Unlike $NODELETE and $REPORTNAME, $USETEMPFILES has a Zen report class parameter equivalent called USETEMPFILES, which you can set to 1 in the Zen report class to enable the $USETEMPFILES feature without using a URI query parameter. A $USETEMPFILES query parameter supplied to the browser overrides any value set for the class parameter USETEMPFILES in the Zen report class. When you are diagnosing style issues, the .xsl file may be the only file of interest. $USETEMPFILES only saves the .xsl file. If you have not run any reports with XSLTMODE="browser" and USETEMPFILES=1 then ^%SYS("zenreport","tmpdir") is empty. Note that this command deletes only those temporary files related to the Zen report class specified in the command, in the namespace where the command is run. The default value for $USETEMPFILES is 0 (false). It can be difficult to debug the Zen report output that appears in browsers. Some of the difficulties arise because when you use XML+XSLT in your browser, asking to View Page Source presents you with the original XML file, not the XHTML that you might have expected. This makes debugging XSLT transformations somewhat difficult. Often what is needed to understand a Zen report problem or debug the XSLT is not a full-fledged XSLT debugger like <oXygen/> or XMLSpy, but a representation of the XHTML that corresponds to the browser's rendering decisions. This section describes how to achieve this in Firefox and Internet Explorer. There are XSLT debugging tools available for IE which you can find by searching the Web for debug XSL output in IE. InterSystems does not recommend a specific tool, but there are many available. The files that you can use for debugging are output in the general Caché temporary directory with names like 2172nQ1_2.xsl and 2172UZ9x1.xml. When you save intermediate files in this way, the generated .htm file is generated by the Saxon parser, and does not render in the Firefox browser in the same way as the XHTML produced by Firefox’s built-in XSLT renderer. In the newly opened window, ask to View Page Source. You can now see the XHTML that corresponds to Firefox’s rendering decisions. In order for Zen report generation to work correctly, the generated XSLT must be able to locate the elements in the generated XML. Zen reports that use the <call> element can be more complex in terms of the matching between XML and XSLT. The following information on the attributes used when calling subreports from the ReportDisplay block may be helpful in resolving problems. The subreport attribute provides the mode attribute of some instances of xsl:apply-templates and xsl:template. The subreportname attribute provides the value of the match attribute of some instances of xsl:template and contributes to the value of the select attribute of some xsl:apply-templates elements. Also see the section Viewing Intermediate Files for information on using $REPORTNAME to view generated XSLT.